We are now offering private label versions of Formsite to customers with more than 50 accounts. Our private label version is a custom version of Formsite that runs on the domain of your choice, on a dedicated server, and with your branding. There is no mention of Vroman Systems or Formsite.com anywhere on your site. We provide you an administrative dashboard application that gives you full control over all of your accounts including the ability to add, update, disable, and upgrade accounts. With a private label version of Formsite, you have control over all external pages. You also have full control over pricing. We have great flexibility and can make customizations to our offering to meet your needs. See the Private Label page for more information. From day one, performance has been a high priority of ours and we continue to strive to do all that we can do to have a high performance site. For this release, we spent considerable effort upgrading third-party components, rewriting inefficient code, and standardizing visual components across our application. We have also re-worked things so that we can more efficiently add new features next year. After considerable effort, we are proud to roll out our new layout/design for the external pages of Formsite.com. In addition to a modern presentation, we have added considerable content in an effort to detail all of our capabilities. We have also added “remember me” functionality to the login process. This is now an option on the Login page. In order to implement new security enhancements and to support the new “remember me” function, we have moved the login username and password fields off of the home page onto a separate Login page. In the spirit of the back to school season, we have added Scoring. Scoring points can be assigned to form items and a total score is calculated on a running basis as the user moves from page to page through your form. 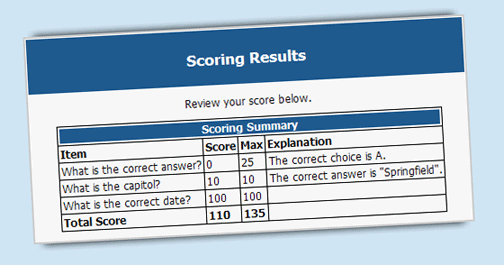 At the end of a form, the total score is available and can optionally be presented to the user. You can optionally show the user a scoring summary at the end of the form. We also have added the ability to include “explanations” on an item by item basis. When setting up Scoring, you can define a total point value for each item or you can define a different point value for each of an Item’s choices. Historically, the reports and data downloads from Formsite have used items’ question text as identifiers. For example, a question on a form might be, “What is your first name?”. Any reports and downloads would use “What is your first name?” as a column header or identifier. With this release, we enable you to define Custom Labels for each item on your form. So, you could define “first_name” to represent “What is your first name?”. 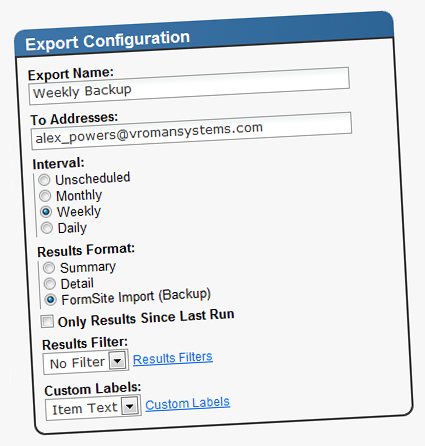 In an effort to help our customers automate their business processes, we have added the ability to schedule exports of Formsite data. Scheduled exports can be set up daily, weekly, and monthly and contain either the full data set or results since the last export. 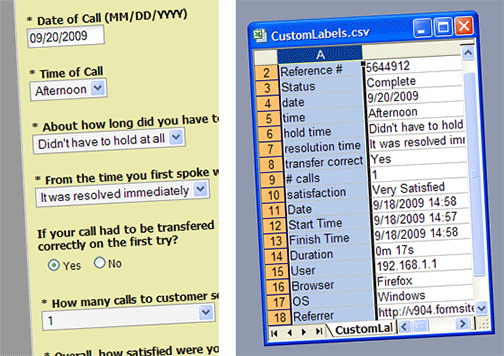 You have the same format options as the immediate export including Excel, CSV, tab delimited, and custom delimiter. 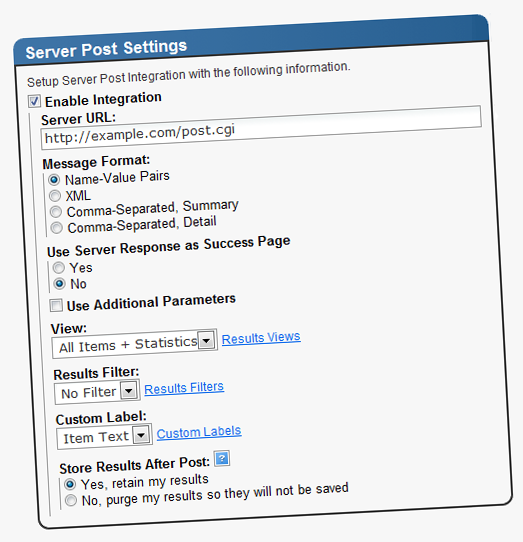 Integrations are hot right now and with this release we are introducing Server Post Integration, a way to have your Formsite form post data into another application immediately. So, when your form is submitted, not only is the data immediately stored in the Formsite database, but an HTTP Post is sent to the server of your choice with your data. This enables you to use the front end features of Formsite with your back end. The data posted can be in several formats including name/value pair, CSV, and XML. We are excited to announce that we have completely overhauled the Look & Feel for new forms created at Formsite.com. To keep things fresh, this is our fifth revision to the Look & Feel of our forms in ten years. Existing forms will remain unchanged unless you elect to change them. To keep up with the times, we have changed the default font, added spacing, added a drop shadow, added gradients, and updated our color schemes. 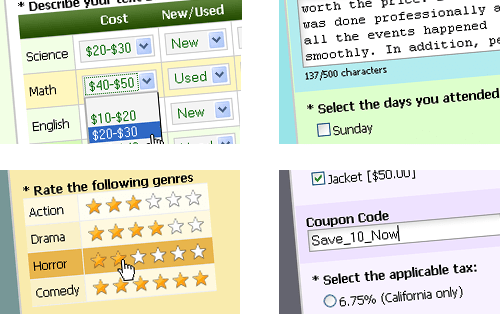 Based on user requests, we are introducing 4 new form Items: Star Rating, Coupon Code, Dropdown Matrix, and Dropdown Multi-Scale Matrix. 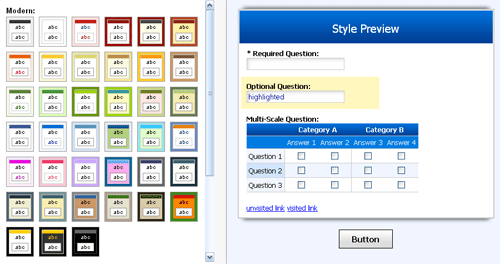 The Star Rating item enables the user to give an item a number of starts on a scale that you define. This Item could be used to have users rate a new movie from 1 to 5 stars. For Order Forms, we have added a Coupon Code item that can represent a percentage or fixed dollar amount discount. You can define more than one Coupon Code per form. You can also setup a link to Pre-Populate the Coupon Code on your form. This enables you to setup a link from your page that could be something like “click here and save $5 on your order”. We have developed a very powerful integration with Salesforce.com enabling any Salesforce object to be mapped to a Formsite form, including custom objects. Our process is very slick in that we can automatically map your Formsite fields to a given Salesforce object. This means that you do not have to do the manual mapping and that you can have a Formsite form setup and integrated with Salesforce in just a few minutes.